Ideally located just few steps from the Lion of Belfort and its fortified town, the BEST WESTERN Hotel Belfort enjoys a privileged location in the heart of this walled city. At the opposite the station, it is also served by bus, taxis and by train. Moreover, with its private parking, the BEST WESTERN Hotel Belfort welcomes you in the best conditions for a perfect stay in Belfort. Chic and completely renovated, with contemporary lines and modern furniture, the BEST WESTERN Hotel Belfort will mark your mind. This unique place, combine an elegant , warmth atmosphere and offers an amazing setting of relaxation and conviviality. 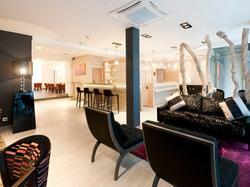 Calm: for relaxing or business stay, the BEST WESTERN Hotel Belfort offers peace and serenity for a quiet stay. Carefully decorated, each room becomes a comfortable setting in which to settle down for a few nights.